Laura Victoria Band, The | The Goose Is Out! 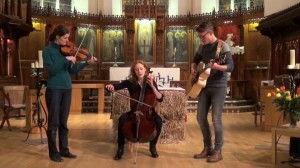 Singer Songwriter Laura Victoria performs original and traditional songs of love and life, accompanied by herself on the cello, Jo Cooper (fiddle and banjo), Ben Moss (guitar, melodeon) and Sarah-Jane Miller (flute, mandolin). “Laura plays and sings with fire and intelligence. She’s got that vital spark”. Lewes Folk Club. “Her set covers traditional folk songs and jazz standards; her voice evokes Nina Simone one minute and Tori Amos the next. There are sombre moments but she can rock out with that cello when there’s a sour relationship to batter into the ground”. The F Word. Laura’s debut EP was released by Cherry Red Records. fRoots said “Both quirky and strangely irresistible”. The debut album ‘Head Above Water’ produced by Mark Wallis (Marianne Faithfull, Joan Armatrading, Alabama 3) is due in 2014. Originally from Northumberland, Laura studied Folk and Traditional Music at Newcastle University before moving to London. She started gigging as a ‘cello singer’ in 2006, playing at venues and festivals throughout the country. “Absolutely unique – a brilliantly strange and haunting take on folk music”. Bob Fischer, BBC Radio Tees.